The French & Indian War was the American colonial extension of the global conflict known as the Seven Years' War (most fighting took place between 1756-1763) between two European coalitions led by the Kingdom of Great Britain and the Kingdom of France. Named after the two main adversaries of the British colonists - the royal French forces and their Native American allies - the French & Indian War spanned across the Adirondack region. Significant area events during the war included the Battle of Lake George, the surrender of Fort William Henry, the much debated massacre that occurred when the British retreated to Fort Edward, and the Battle of Carillon. The French & Indian War unofficially began in 1754 with territorial disputes between the French and British, both of whom wanted to increase their land holdings and take advantage of the fur trade in North America. The first battle occurred when young George Washington, a then-colonel in the British army, built a small fort on the Ohio River in Pennsylvania, known as Fort Necessity, and defended it against a surprise attack from the French. Two months later, Fort Necessity was taken by the French and Washington temporarily resigned, later returning as a volunteer. More battles followed between the two European powers and war was officially declared in May of 1756. Meanwhile in the Adirondacks, the British began construction on Fort William Henry at the southern end of Lake George. This sparked action from the French and in September of 1755, the French and their Native American troops engaged in multiple battles against the forces of British Colonel William Johnson, collectively known as the Battle of Lake George. Fighting took place in the engagement known as "The Bloody Morning Scout", when a British column marched into a French trap that resulted in substantial deaths on both sides, including British Colonel Ephraim Williams and Mohawk King Hendrick. Significant French losses also occurred under fire from British Captain Folsom's forces, during which the bodies of the killed French troops were thrown into a pool of water, which to this day is known as Bloody Pond. Although the battle was inconclusive, it inspired early versions of the song "Yankee Doodle" and the British went on to complete the construction of Fort William Henry. The French countered this move by building Fort Carillon (later renamed Fort Ticonderoga) on the northern end of the lake. In August of 1757, Louis-Joseph de Montcalm, commander-in-chief of the French forces, laid siege to Fort William Henry, forcing Lieutenant Colonel George Monro to surrender and negotiate terms for a safe British retreat to Fort Edward. As the British retreated on August 10, they were attacked by the Native Americans who had fought as allies of the French. There still remains much speculation as to why the massacre occurred and how many people were killed, with reports varying from a few dozen to over one thousand deaths. The massacre was later dramatized in James Fenimore Cooper's book, The Last of the Mohicans, and its numerous film adaptations. British Generals James Abercrombie and Lord Howe assembled a force of 16,000 men in July of 1758 - the largest single force ever deployed in North America at the time. The British forces attacked Fort Carillon with plans to overwhelm the significantly smaller number of French soldiers. The French were able to defend the heavily fortified fort, taking much fewer casualties than the British. The day ended in victory for the French and was the bloodiest battle in the entirety of the French & Indian War, with over 3,000 casualties suffered. French losses elsewhere left Fort Carillon ill-equipped, which lead the French to destroy and abandon the fort in 1759. The British seized the fort, repaired it, and renamed it Fort Ticonderoga. The signing of the Treaty of Paris on February 10, 1763 officially ended the French & Indian War (and the larger Seven Years' War), leaving the Adirondack area firmly under British control. Celebrate American history by visiting these legendary forts for a fascinating and intimate glimpse into the events that shaped the future of our nation. Both Fort William Henry and Fort Ticonderoga have been reconstructed and are now accessible for public tours, military demonstrations, and even more fascinating historical details about the battles fought in the Adirondacks. 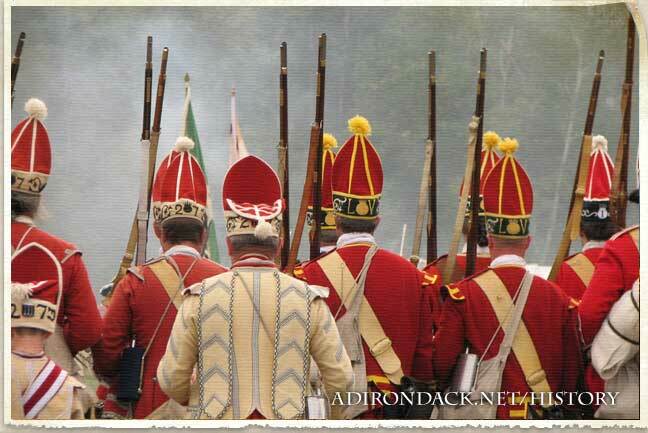 The history of the French & Indian War lives on with historical re-enactors - lovers of the past who are passionate about portraying the events of a particular time as accurately as possible. At the forts you can watch reenactors bring history to vivid life amid the smoke of cannon and musket fire, as well as the colors, sounds and smells of an 18th century battlefield.